UW-Whitewater to host Track and Field Learn-by-Doing Clinic on Sunday, February 17. UW-Whitewater's Throws Coach, Dave Hahn, will lead you through a day of throws training. 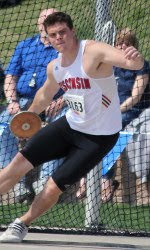 Coach Hahn has coached 33 All-American's and 7 National Champions including former Madison Throws Club athlete Dana Thompson to her NCAA National Championship in the DISCUS. I recently had the opportunity to attend John Godina's Phase II Coaches Course. It was a great day of learning about advanced rotational concepts in the throws. Lots of different Drills to correct common errors in the Rotational Shot and Discus. I highly recommend Coaches attend his Phase I Course and Phase II Course if you have the opportunity. And if athletes have the chance to attend his Phase I, Phase II Athlete Clinic or a World Throws Center Camp, I highly encourage you to sign up. Advanced Rotational athlete's could try this drill it really forces you to work on staying on the right in the middle and not allowing any weight to shift to the left because you are doing an extra 180 turn at wheel past Power Position. Great Drill - very difficult - beginners beware...advanced throwers see if you have what it takes to match John's movement. 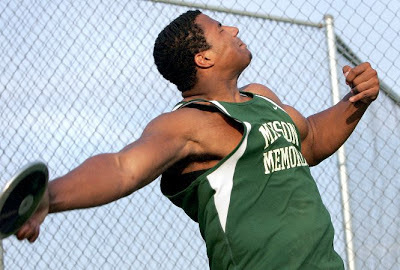 THROWING NEWS: Olympic Gold Medalist Adam Nelson? I like the sound of that. 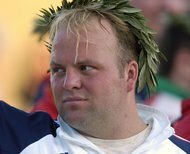 The International Olympic Committee on Wednesday stripped four track and field athletes of the medals they won at the 2004 Games in Athens for doping violations after reanalyzing their urine samples and detecting steroids. One of the athletes is Yuriy Bilonog of Ukraine, who won gold in men’s shot put. Which means Adam Nelson of the United States would now be recognized as the Gold Medal Winner. Nelson said he was elated after hearing the news of Bilonog’s positive test on Wednesday. “I heard rumors about Yuriy and doping at the Games,” Nelson said. “But I dismissed them. But now it comes to light that it’s true.”"
Here is video I took of Nelson winning the 2011 U.S. National Meet in Eugene, Oregon. Coach Frontier lives in Fitchburg with his Wife Christy and 2 kids. throwBIGthrowFAR.com - for throwers and coaches who want to get better! 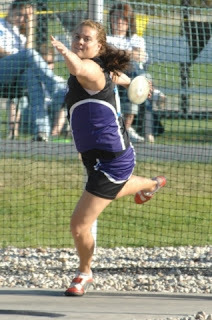 "It only takes 1 throw to win at state but a hundred thousand to prepare for it!" "Throw with the BEST - Beat the BEST - Be the BEST"